Display clean and simple notifications using a component for Vue.js, deeply inspired by Notie.js. Check the Live Demo Components are one of the most powerful features of Vue.js. 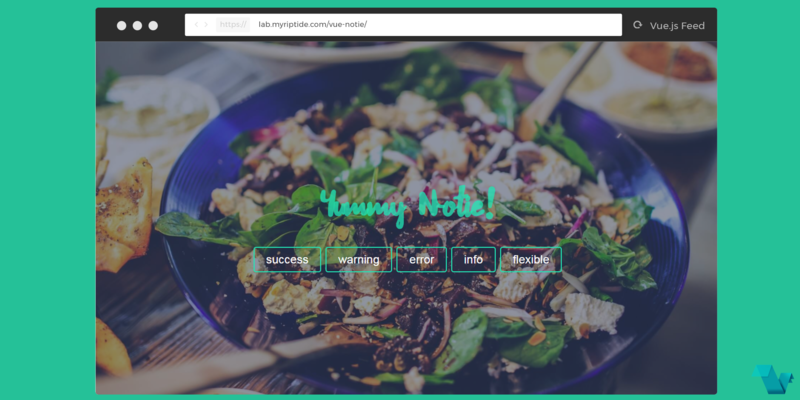 Yummy notie is a component which can help you to alert users. To install it in your Vue projects, since vue-yummy-notie it is a component instead of a plugin, all you need to do is import the module and pass options with props or vuex. The sample was set up by vue-cli's webpack template. You need to import Notification.vue in the component folder into your project. Then you can regist it and use it in the HTML template. //you can use HTML to represent any kind of notification. You need to set show = true to init a notice, and also pass the content you want to show by setting 'options'.